Sunflowers seeding, Asparagus beans top the trellis, honeybee spotted! 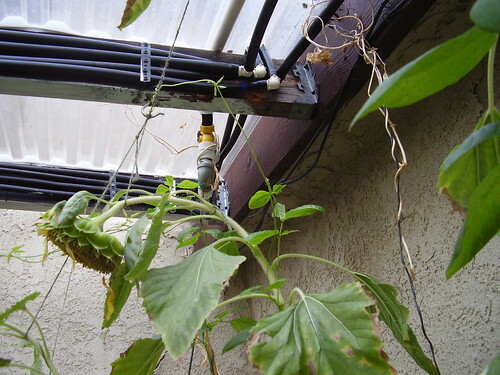 The sunflowers I grew as poles for the yardlong beans are beginning to show their black and white seeds. The beans, meanwhile, have begun to top the sunflowers and I have made an extended trellis to bring them overhead; hopefully the beans will hang down for easy picking. But after so long without any pollinators; not bumble bees nor hoverflies nor any wild bee to be found, yesterday I saw a lone honeybee, probably lost, because there are not too many flowers just now, but perhaps looking for a drink from the water conditioner tank for my fish. Wasps I have seen, as many as a half-dozen at a time; presumably preying on aphids and other pests. 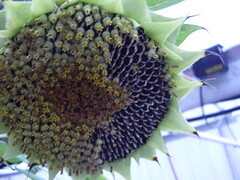 But there were no bees on my sunflowers, (now bloomed out) though I had high hopes for them. But this lost bee gives me hope that they will return to my neighborhood. Maybe I can put out some sugar water or find some other way to attract them. Topping the trellis.vines are about 5 feet tall. ovaries are beginning to fall off, revealing black seeds. Leaves beginning to die back.